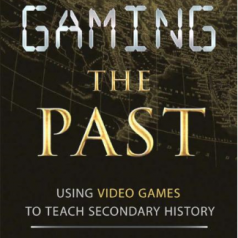 Routledge is releasing my new book, Gaming the Past: Using Video Games to Teach Secondary History in just a few days (May 24th). I’m very excited for its release as, to my knowledge, it is the only book of its kind anywhere: a practical guidebook taking history and social studies teachers through all the steps of designing and implementing lessons and units using simulation games: selecting games, planning lessons, managing classes, and designing activities and assessments. Although its core audience is high school history teachers, educators at the middle school and college level, will, I believe, find the book useful. Play the Past was kind enough to ask me to spread the word on their site, and so, I’ll take the space to explain how I got to Gaming the Past and why it’s important. I began teaching high school history immediately after I finished my Ph.D. at Ohio State (2000). In those days I was teaching at a boarding school for boys who had not yet succeeded at academics. Simulations of the pen-and-paper variety quickly became part of my repertoire. Somehow there was a world of difference between asking students to list the features of Soviet propaganda in the early years and having them pretend to be Soviet propaganda ministers designing their own campaign. I was dabbling back then (I like to call it experimenting now), but I found that simulations gripped students in a way few other instructional strategies could. When I relocated to Cincinnati Country Day School in 2002, a new world opened for me. Country Day was the first independent school (probably the first school) to implement a 1-to-1 laptop program for its students, grades 5-12. Equally as important, it’s simply an amazing place built on a terrific student body and faculty. Over the next few years I explored the effective use of computers in the classroom as research and note-taking tools, learning from my colleagues and trying out my own ideas. I continued to play with tabletop simulations along the way and began to experiment with video games, first using Civilization III in the class, then Rome: Total War. At the time there was very little available in the way of centralized comprehensive resources for teaching with simulation games in history. More to the point, too few of the resources were practical enough. By practical, I mean, providing specific and concrete ways that a teacher can use a tool in his/her class. This was even true for pen-and-paper simulations There were interesting and helpful articles from the 90s here and there about simulations teachers had designed, especially in the History Teacher, but the major works on classroom simulation had been written in the 70s, at the crest of the wave of simulation excitement that spread through some circles of education beginning in the late 60s. These tended to be completely outdated at worst and certainly not up-to-date from a pedagogical perspective Essentially, I was left to my own resources and those few terrific articles and books from the past. I did keep hoping to strike the mother lode, the book that would serve as a foundation and allow me to improvise. Fortunately for me, Kurt Squire—now associate professor at University of Wisconsin-Madison, home to an exceptional group of scholars investigating the power of games as learning tools in all facets of society—heard about my experiment. He invited me to be part of a panel on the use of Civilization as a learning tool at the Education Arcade in LA 2005, a MIT/UWD initiative on games and learning. When I went I found that in a conference on games and education, I was one of very few high school teachers present (or middle and lower school teachers for that matter). I was very graciously received and learned two critical points that shaped the next six years of my work on historical simulation games. Classroom teachers’ perspectives on games and learning were not well known or widely expressed at that point. There was a terrific amount of theoretical and experimental work on the value of games in learning taking place, but too little of it was being translated into practical classroom guidelines for teachers. I thought that I might best play a part in the growth of simulation games as teaching tools by bridging theory and practice, taking what I’d gleaned from the theory, and then communicating what I had tried in the classroom, why I did, and what I’d learned that could be useful to teachers. Since then, I have worked on helping other teachers implement simulation-based lessons, even launching a resource website for teachers, Gaming the Past . Along the way I have met a number of teachers who also experiment with using games effectively in the classroom. It is still the case, however, that the teacher who wants to start from scratch and learn the practice of effective game use has very few places to turn. There are presentations here and there at conferences, but few make their way out of those conferences to a wider audience. The burgeoning academic field has produced many excellent writings on games and learning, but these do not tend to address specific classroom practices. Reports on classroom games and learning by various educational presses have tended to be so broad in coverage that they still leave readers with the basic response: “This is great; I’m ready to use simulation games! I still have no idea how to do it.” Despite this lack of resources, many teachers have pioneered their own way through the landscape of simulation-based lessons. Some even share their experiences on the Web and at conferences like the GLS. That’s terrific, but it is also a very hard way to spread what I believe should be such a critical part of 21st century history education. Teachers already have so much on their plates; having to craft entirely new pedagogies from a few scattered case studies and tips should not be among them (unless, of course, they happen to enjoy it). Not when the potential of historical simulations as learning tools is so great. So that was the motivation for GTP, the hope that providing a first take on a teacher’s guidebook would empower more teachers to develop simulation-based lessons, and share their experiences. It is being marketed to education programs for pre-service social studies teachers, but it is my sincere hope that it will be equally as useful to practicing teachers who will do incredible things with simulation games if they have just a bit more practical guidance. Ideally, it will confirm and give more ideas to teachers who are already using simulation games in the class and inspire a number who aren’t to take the leap. If you do happen across it, please let me know what you think. Hello I’d like to get the book reviewed for The International Journal of Gaming and Computer-Mediated Simulations (IJGCMS)-is this possible? That would be great. My understanding is that anyone interested in reviewing should contact Heather Brown in Marketing at Routledge/Taylor and Francis (Heather.Brown@taylorandfrancis.com). Educators interested in using the book for their classes can also email her to request an examination copy. There is also a link for requesting an exam copy on the Routledge page. http://www.routledge.com/books/details/9780415887601/. Thanks for the interest.